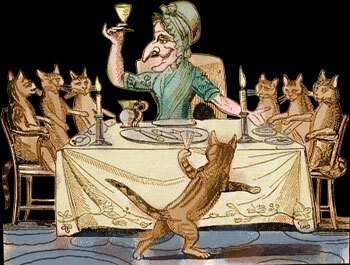 My name is Anne M. Bedics and I am the proprietor of The Cat Lady Antiques. I have been a collector for over 30 years and been in the business, in one form or another, for over 20 years. My specialty and true loves are period textiles, cloth dolls and sewing items, primarily found in the eastern Pennsylvania region which I call home, as well as the southeastern Pennsylvania area where I have my shop. You will also find painted smalls, furniture and folk art as you browse these pages. All items are in original condition and surface unless otherwise noted. My counterpart in the business is my husband and dear companion, Tom Kort. While I do most of the buying and display, he does most of the hard work of getting us ready to get to show and shop and those tasks attendant with it, while also acting as my business manager. While it is true that a large portion of my offerings are found in the area, I also go on buying trips and do shows in New England, the South, and Midwest. I buy what I know, as well as that which catches my eye both in form and function. I am committed to bringing you quality antiques in excellent condition. 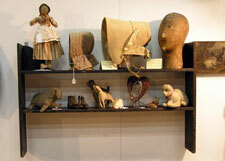 I also manage a small 25 dealer country antiques show called “The Heart of the Valley”. We will be going into our ninth year in April 2009. It is held in the “Ice House”, a charming 19th C stone warehouse on the banks of the Lehigh River in the “heart” of the historic district in Bethlehem, Pennsylvania. 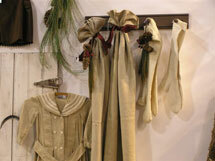 It has received great reviews from dealers, show-goers and the trade press. I have a great group of dealers who do an excellent job of transforming the venue with its thick stone and brick walls into an antiquer's wonderland. It is a spectacular place to do a show, and I am ever grateful to our loyal fans who allow us continue this venture by coming out to support us every year. I enjoy folk art for its whimsy, and especially that which I like to term “soft folk art” or ladies’ work. This includes home-made cloth dolls and animals, sewing items such as pin cushions, pockets, sewing rolls, samplers, quilts and all those wonderful things that women did in the past as ways to express themselves when there was much work to be done and very little time for true artistic endeavor (save for that done in the girls' academies and finishing schools). You will also find that I have a passion for period everyday homespun linens and blankets found on farm and home in this region. I owe my love of textiles to my mother, Anna - “Seamstress Extraordinaire” under whose tutelage I developed my eye for quality, color and design. I have been collecting these for years and am now offering pieces from my collection for sale here.